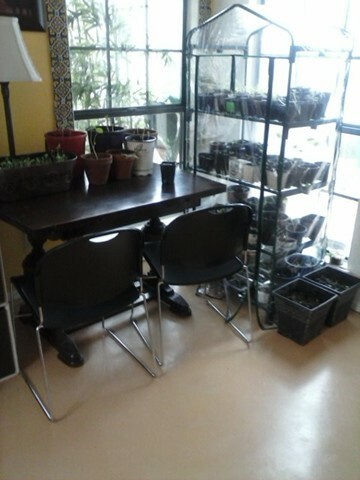 A photo of my greenhouse on the left posted a week or so ago and then one of it today in my kitchen--bursting at the seams and overflowing into my kitchen with seedlings that are fast-becoming plants. 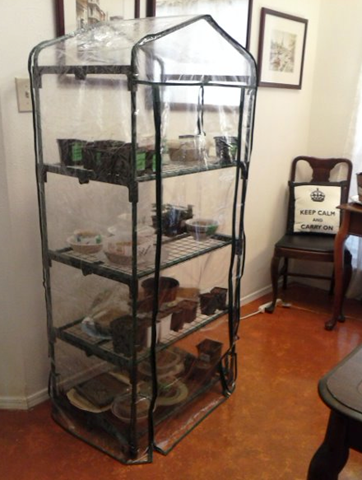 Over the weekend I moved my portable greenhouse from my dining room into my kitchen where the plants can get better light. Also, over the weekend, I increased the square footage of my urban garden from 435 to 636 square feet--large enough to supply three adults with all their vegetable and fruit needs for a year. All this flurry of gardening activity is remarkable in light of the fact that I planted my first garden in June of 2013. Yes, from time to time I attempted to grow a few tomato plants and once or twice I tried to plant a real vegetable garden--only to have the plants die before maturity. But last year was my first successful attempt at planting of a variety of vegetables and a few fruit treee and berry bushes and plants. The only things that did not grow well were squash and two tomato plants. However I did have great success with one of the tomato plants--a small pear-shaped tomato, from which I saved the seeds and have 50 seedlings started in my greenhouse. All of the other crops were enormously successful: okra, carrots, kale, cilantro, lettuce, Swiss chard, grapes, blueberries, and egg plant. I attribute it all to raised garden beds which are filled with amended soil (1/3 compost, 1/3 vermiculite and 1/3 sphagnum moss). After the plants are up about five inches, I add straw mulch to help slow down the drying of the bed as well as to keep the roots cool. The vermiculite and spahgnum or peat moss help with water retention and reduce the need for water. I used less water last summer with my front-yard garden than I did when it was a lawn. You see, when the space around the beds (now covered in wood mulch) does not need to be watered, it cuts the square footage of the area to be watered by almost half. I expect to use even less water this summer since last year I had converted only about one-third of my front lawn. This year it will be two-thirds converted to garden space. Today I'm busy writing a grant to be presented to the Neighborhood Vitality Matching Grant Program. This program will be administered by Loving Garland Green. 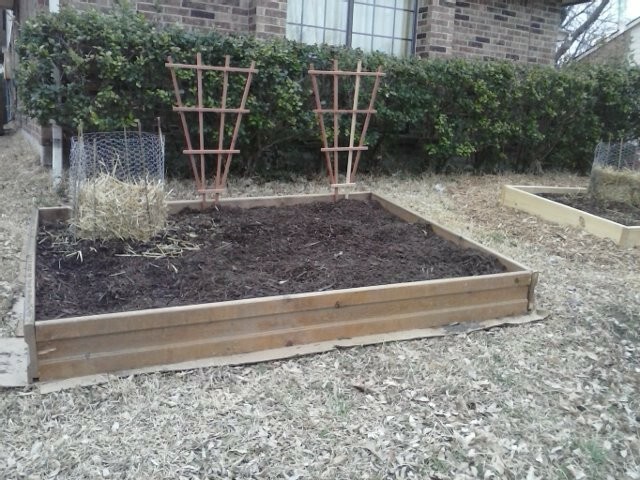 We are proposing to install one raised garden bed for residents of Garland who apply on a first/come, first/serve basis and who agree to the two requirements of our program: 1) to keep records of crop yields and submit them at least on a monthly basis to Loving Garland Green and 2) to pass it forward within the year--by assisting another resident in establishing an urban garden and/or by sharing at least 10% of their produce with another family. If and when we are funded for this program, residents of Garland will receive an email address to write to in order to enroll in this program. We will make this announcement on our website at LovingGarlandGreen.org, on Eat Green DFW, on NextDoor, and likely somewhere on the City of Garland's website. Residents who do not own their own home and whose landlord does not provide permission for them to establish a raised bed will be provided the option to use this program to build a garden plot in the Garland Community Garden located at 4022 Naaman School Road. Members of Loving Garland Green are convinced the majority of those who participate in our program won't stop with one garden bed. Before long, they too will be bitten by the garden bug. 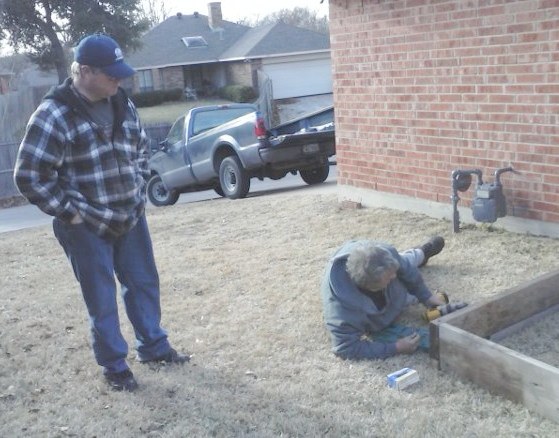 We can expect many more urban gardens springing up all over our city of Garland. And even more magic will transpire because gardens bring people together. Bringing people together--neighbors to neighbors and family members to family members--is one of the best aspects of gardens. However, gardens do much more: gardens make people and communities healthier; gardens make communities more food secure; and gardens stimulate local economies. 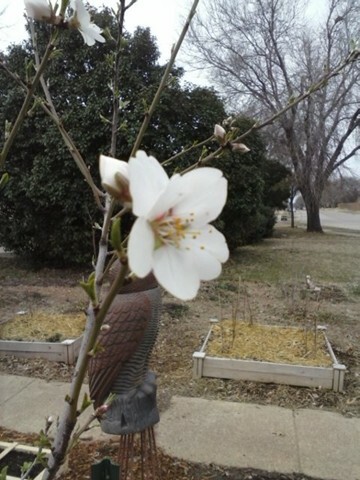 This morning, after hearing on the news the mercury is dipping to 32 tonight and 29 tomorrow night, I walked out into my garden to see one of my almond trees bursting into bloom. Later this afternoon I'll be covering it and other early risers in my garden with a planket. 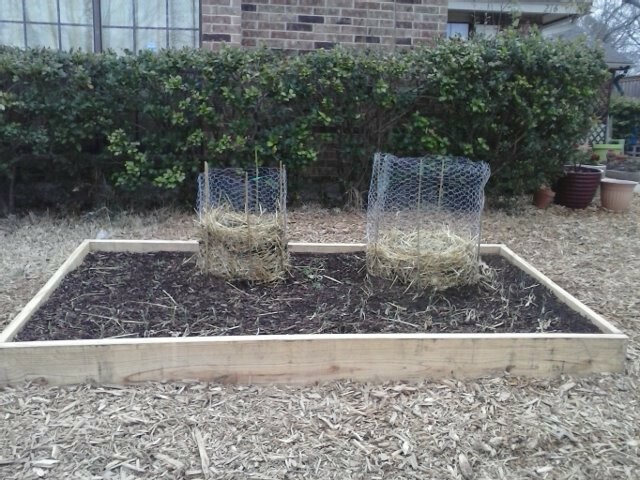 Since I last wrote, I've added four raised beds to the urban garden in my front yard. This brings the total number of raised beds in my front yard and side driveway in back to 29 beds. The total square footage is 636 square feet. I estimate the market value of the crops I'll be growing in the spaces (Mother Nature willing) at $4,500 to $6,000 for 2014. I still have room for approximately 400 square feet more of raised beds which would bring my total to a little over 1,000 square feet of growing space. I don't plan to add any more new beds this spring. However, I do plan to cover all the rest of my grass with cardboard and mulch on top. One conservative estimate suggests that is takes about 200 square feet of raised garden beds to provide a season’s worth of fresh produce for a single person. By this estimate, a garden 800-1200 square feet should yield enough fruits and vegetables for a family of four. [Source] I will be keep records this year of my crop yields. In the fall, I'll let you know what I think. I'll be using less water to maintain this garden than I used to maintain the lawn as I've actually reduced the square footage of the space that requires watering. Furthermore, it will require less work than the lawn. Currently almost one -third of the beds are planted in perennials such as blueberries and blackberries which will come back every year. It is expensive the first year--putting in the raised beds, adding soil to the beds, mulching, etc. However this is a front-end expense. Starting the second year, your only cost is water which you might pay anyway for a lawn. You can also reduce the cost of water by harvesting rainwater and also using ollas. Below is a square foot garden 4' x 4' (16 square feet). The soil for this garden is a mixture of 1/3 compost, 1/3 vermiculite and 1/3 peat moss. Unlike traditional rows, these gardens (originated in the 1980's by Mel Bartholomew) divide the planting spaces into foot squares. 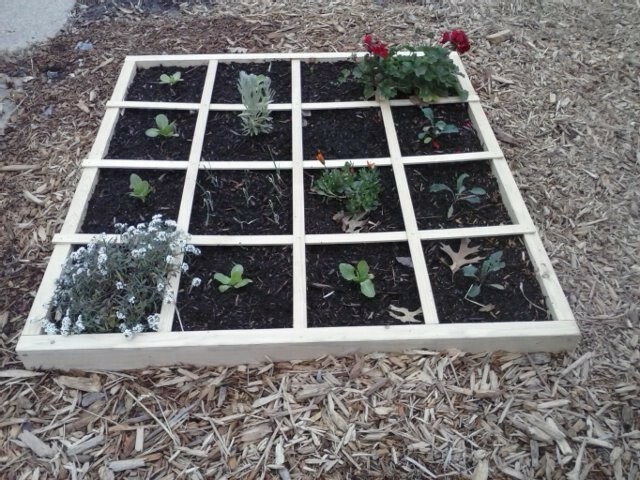 I've planted oriental cabbage, lavendar, geraniums, radishes, carrots, kale, and Alyssiums in my square foot garden. Below is a raised bed that breaks one of the cardinal rules for raised beds: Do not make them any wider than four feet. This ensures that you don't have to step into the bed to tend to the plants. Sometimes when using found materials one has to bend the rules a bit. This bed is 6' x 8'. The wood for this bed actually once was a bed--the kind people, not plants, sleep in. It is made of solid knotty pine. I rescued it from a trip to the dump the other day. It currently has a potato tower. Later on in March I'll plant zuchinni for one trellis and cucumbers for the other. Along the front and sides of the box I'll plant tomatoes. Below is a photo of a bed I added last week. This bed is 4' x 8'. It features two potato towers, onions, radished and califlower. Frankly, I don't think the califlower are going to make it. 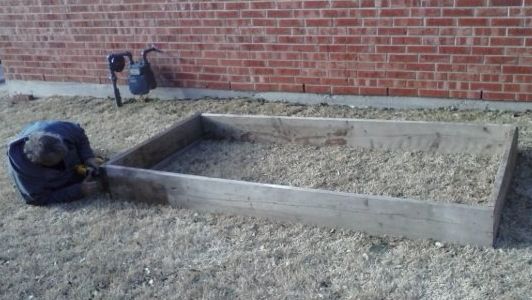 Below is a 2.5' x 5' raised bed. It contains a Dwarf Kangaroo Paws (Angozanthos) a perennial that blooms spring through summer and is hardy to 10 degrees F. Also featured are some marigolds. I put this box on the other side of my grapevines. Potato Planting Time: Doing it! 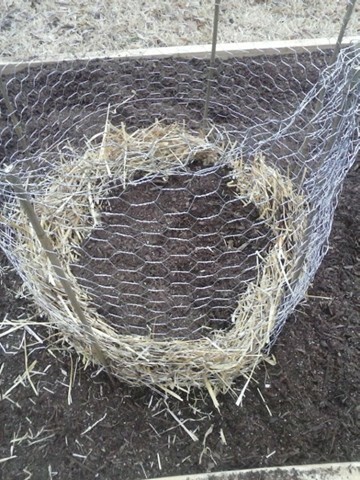 I cleared away the compost down to the cardboard in the bottom of my raised bed and set the chicken wire cage inside. Then I shoveled the soil back inside the cage and put straw on top of the soil and built it up about four inches all around on the sides to make a nest. Next, I shoved about 4 inches of compost on top of the straw. As a final step, I shoveled about four inches of soil and straw on top of the potatoes. Now my potato tower looks like it did in Step 1. When the potato plants are about 6 or 7 inches high, I will once again cover them in soil and straw just up to within an inch of their tops. 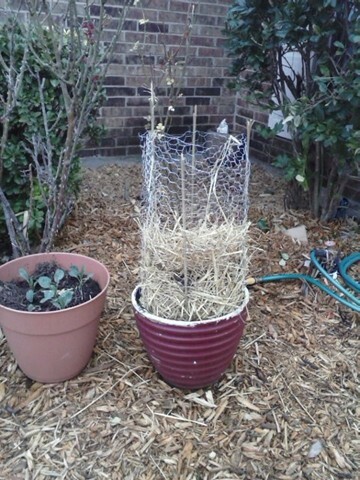 This process of layering with soil and straw will end when the potato plant begins to bloom. At that time, some of the potatoes on the bottom level will likely be ready to harvest. Seed Potatoes. The two smaller ones can be planted whole. The larger ones will be cut into two or three pieces, each one with an eye. Now is the time for Potato Planting! A few days ago I ordered online organic Yukon Gold seed potatoes. They should be here on Monday. Then on Saturday, I stoped by Rhodes, one of our locally owned nurseries here in Garland, Texas, and purchased the seed potatoes shown in the photo above. 1. A wire cage. 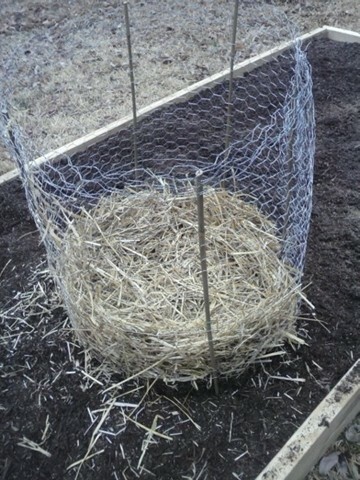 You can make a cylinder of chicken wire. 2. A sunny spot ideally where a raised bed is located. 1. Put the wire cage on top of soil in a raised bed. 2. 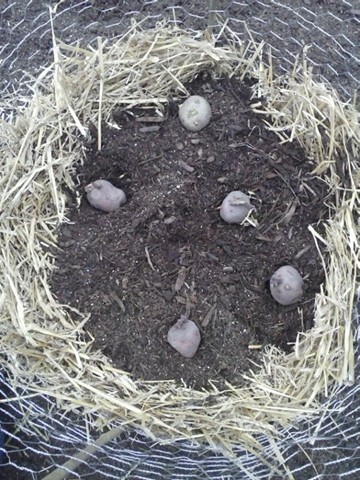 Put the seed potatoes on top of the garden soil inside the cage and cover with four inches of soil. Allow 10 to 12 inches between each potato. 3. In about 2 weeks green foliage should protrude from the soil. 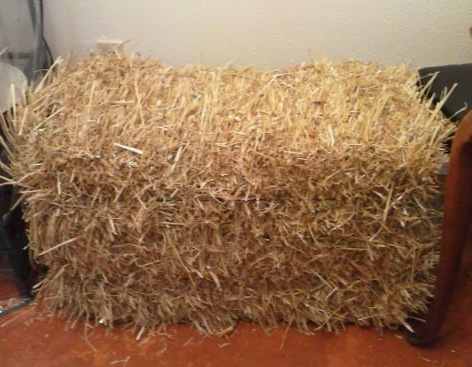 When the green tops are 6 to 8 inches tall, cover up to within 2 inches of the foilage with a mixture of two parts straw to one part compost. 4. Note: Make sure to keep the developing potatoes covered. 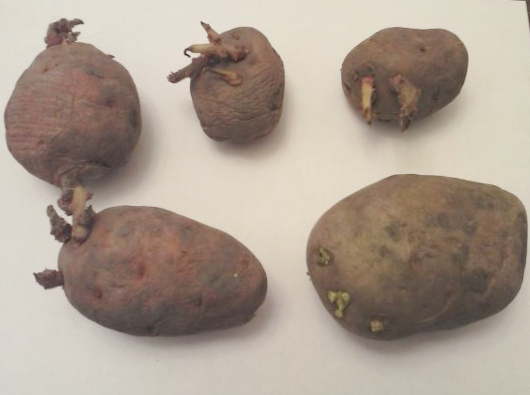 If they are exposed to sunlight, the potatoes turn green and become slightly toxic. 5. During the growing period, you will need to repeat steps 3 and 4 two or three times. Potatoes mature in 60 to 130 days depending on the variety. 6. Stop adding soil and straw when the plants start to flower. You might even be able to pull back the cover and harvest a few new potatoes at this time. Who said January and February are slow months for Gardeners? No one who has talked to a member of Loving Garland Green--that's for certain! 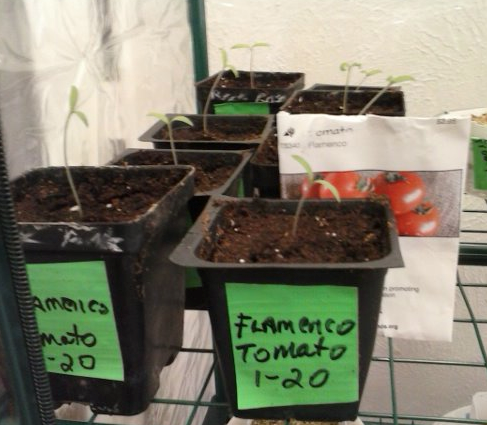 from my seedling greenhouse - Flamenco Tomatoes are part of my ongoing quest to grow a decent tomato in Garland. These open-pollinated seeds I purchased from www.nativeseeds.org. I also planted seeds I saved last year from a small, pear-shaped tomato that was prolific and delicious. My urban garden is registered as the first one with Loving Garland Green's Another Urban Garden program. My garden was installed six months before Loving Garland Green came into existence. We are hoping that urban gardener residents of Garland will also register their gardens with us and I did and share records of their crop yields and experiences with us. Our ambitious goal is to have 50,000 urban gardens registered by the end of 2015. We are convinced that increasing urban gardens not only reduces food scarcity, it also boosts the local economy by creating new markets and by supporting existing markets. 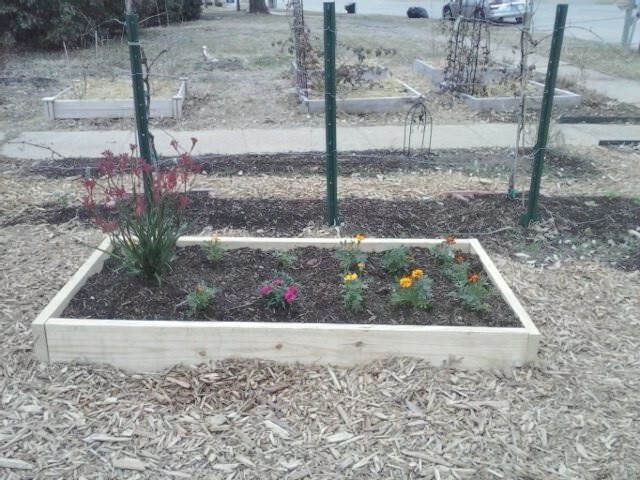 Part of the Another Urban Garden program includes helping citizens of Garland to create their own gardens. To do this, a volunteer from Loving Garland Green meets with an interested citizen to help them plan their garden. For beginning gardeners we recommend starting small the first year with a raised bed no larger than 4 x 10 (40 square feet). We help the resident build the bed, plan the contents of their garden, set it up with some type of water conservation device, plant seeds, and monitor the garden throughout its first season. Eventually we hope to develop this program into a local business that will support 5 to 15 new jobs for our community. 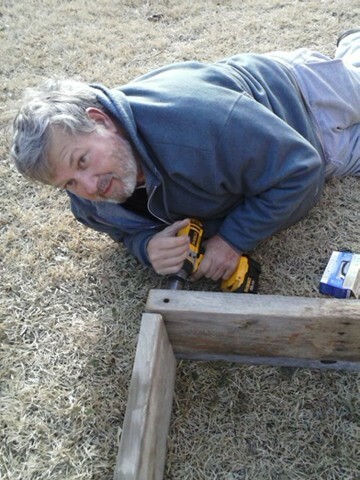 Last week, Charlie Bevilacqua, one of the founding members of Loving Garland Green, helped Ed Downing, one of our new members, to put together the frame for a raised bed (12 feet x 4 feet). Charlie and Ed also selected large clay pots for Ed's container garden surrounding his patio. Below Ed is watching Charlie put together the sides of the raised bed for his urban garden. Below is a snapshot of what will eventually be Ed and Becky Browning's raised garden bed. The sides of the bed were made with reused, found lumber. The soil beneath the bed will not be tilled. Instead, about 9 inches of amended soil (compost and vermiculite) will be placed right on top of the grass inside the box. At the end of each growing season, a layer of compost will be added to the top layer of soil before planting the new crop.